An important lesson about bullying. 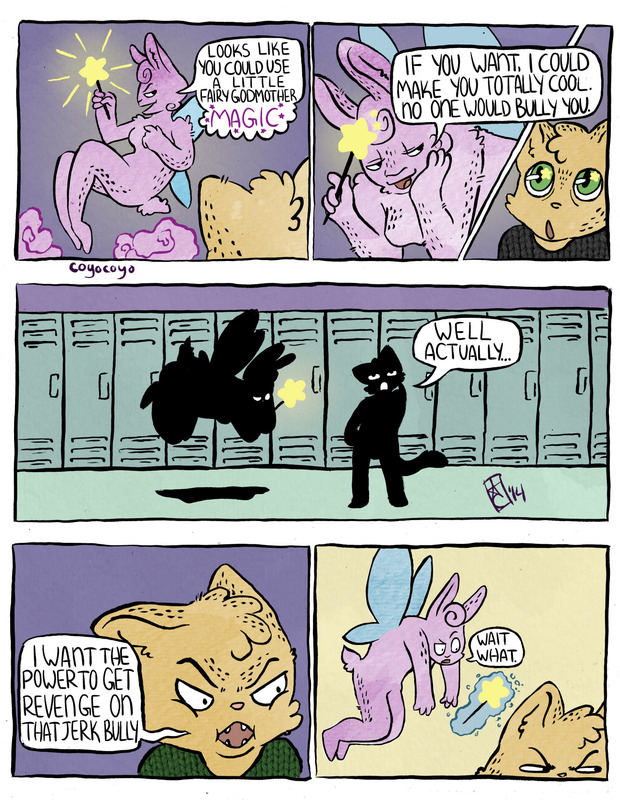 What’s nice about this comic is that it illustrates the fact, yes fact, that often bullies are victims themselves. According to the Guardian – http://www.theguardian.com/education/2008/aug/29/bullying.schools – while 5% of primary school kids bully, only .5% are true bullies. Meaning kids who are confident, high status, and who bully adaptively. The other 4.5% are what is called a victim/bully – meaning they are both victims of bullying and bullies themselves. Why does this matter? Well it matters because 90% of the bullies are bullying because they are being traumatized in some way and because 74% of them are boys who are suffering from depression, anger, paranoia and more. In other words – the overwhelming number of kids who bully – are bullying because they have mental health problems that aren’t being addressed. For adults tasked with stopping bullying, this is hugely important because it tells us that if we want to fix the problem, we need to start addressing the mental health needs of children and this requires a reduction in poverty, access to food, and basic aspects of family security. For kids who are being bullied and their parents, what this means is that the kid bullying isn’t an ogre or a horrid person. They are a damaged person. While this doesn’t mean you should tolerate their bad behavior, it does mean that you should deal with them compassionately. What does it mean to respond to a bully with compassion and why would I recommend that? Well – it means you are doing the bully a favor by reporting them. Because if they are victims and suffering from abuse in some aspect of their lives, compassionately drawing attention to the fact that your classmate is acting badly in a bid for attention, could just be the thing this kid needs. You don’t report to get them in trouble. You report to get them help. And by getting them help, you get them to stop. Bonus. It also means that you don’t need to be angry with them. You don’t have to fight them. You just have to stop them and you do that by calmly telling them that what they are doing isn’t ok and that if they continue, you will report them. And then when they do – report them. This is not something to be emotionally upset over. It’s just what compassionate people do to get people who are so mentally unhealthy that they can’t behave civilly the help they need. Being compassionate doesn’t mean you let a bully walk all over you or that you tolerate their bad behavior. It just means that you don’t need to hurt them more to get them to stop. You don’t need to be afraid of bullies. You need to feel sorry for them and know – the more you report them, the more you are helping them.